Flamingos huddled together in the bathroom at the Miami Zoo during Hurricane Andrew (August 24, 1992). Flamingoes are very fragile and a big stressor like that could even kill one. These situations are usually very scary for the zookeepers. The logistics and creative thinking that go into protecting the animals at times like this are very impressive, not to mention that the keepers still have to go in every day (or sleep at the zoo overnight) during natural disasters to make sure the animals are cared for. In 1992 the zoo was still named Miami Metro Zoo and commonly referred to as Metro Zoo by the locals. Five years ago it was renamed Zoo Miami. “This CD-ROM can hold more information than all the paper that’s here below me”- Bill Gates, 1994. One evening after a long day of hunting and observing wildlife in Somalia, Akeley was headed back to the spot where he’d bagged a hyena and a big warthog earlier in the day, but when he got there all he saw was a couple of big bloody streaks leading off into a thick brush. Akeley froze, realizing what was happening, and when a noise came from the brush, he raised his rifle and fired to try and scare it off. Suddenly, out of the bushes came a leopard screaming towards him teeth-first. Unable to get his weapon back around quickly enough, Akeley dropped his gun and threw his arm up just in time to prevent the vicious beast from ripping out his throat. The leopard latched on to Akeley’s left hand, chomping down with all its might, and kicking at him with its back legs. When his attempts to pull his hand out of the leopards’ jaws only made the creature bite down harder, Akeley, punched his fist further into the leopard’s mouth. The leopard gagged, Akeley pulled his hand out, grabbed the leopard, body slammed it to the ground, and jumped on it with both knees, crushing it to death. Akeley, bleeding profusely from his wounds on both hands, still recovering from his recent battle with malaria, and barely able to stand, then picked up the leopard (despite a shattered hand), threw it over his shoulder, walked back to camp with it, and taxidermized it for a museum exhibit. 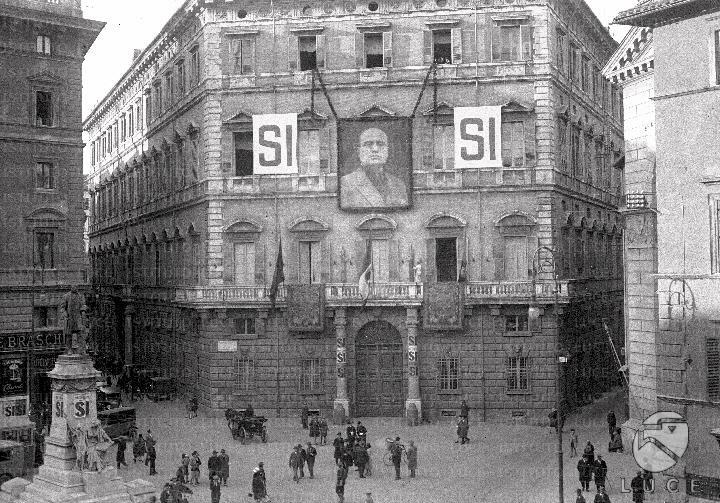 The headquarters of Benito Mussolini’s National Fascist Party in Rome, 1934. This building is Palazzo Braschi, a 19th-century palace. It was used as the Ministry of Interior building after Italy’s unification. Then, when Mussolini took over, it housed the Federazione Fascista dell’Urbe, which supervised sports and charity activities. In 1934, Mussolini had “elections”. You could choose to vote for or against a predetermined list of MPs. This was a temporary billboard imposed over the front of the building advertising that. The building didn’t look like this all the time. Matter of fact, this is how Palazzo Braschi looked prior to the 1929 “elections”.